Dattu Bhokanal: A hydrophobic on whose shoulders rest India’s rowing hopes. Poor family, no water to drink and bathe, premature death of father due to bone cancer, hydrophobia, termination of studies to support family. These are some of the significant events of the first 2 decades in the life of Dattu Bhokanal, India’s sole representative in rowing, at the upcoming Rio Olympics. Even as late as 2012, when Dattu joined the Indian Army to support his family, he never knew, that destiny had planned to take him close to his biggest phobia-WATER. Credit for this should be given in no small measure to his colleagues in the Army, who probably noticed that the 6 feet 4 inches tall Dattu possessed the attributes to be a good rower. In a short time he was relocated to the Army Rowing Node and then to the national camp. The rest as they say is history. In 2014, he won two golds at the Indian National Rowing Championships and the journey from the parched fields in Talegoan, Maharashtra to Hussain Sagar lake in Hyderabad had begun well. Destiny, which had been so unkind to him in his formative years seem to be turning for the better as his hard work and potential started paying rich dividends. A fifth position at the Incheon Asian Games in the double sculls was followed by a Silver at the Asian Championships in single sculls last year. 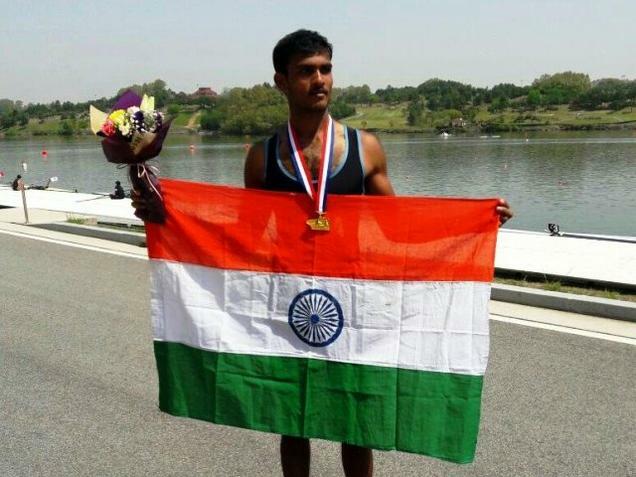 Asian Games bronze medallist Swarn Singh’s severe back injury gave an opportunity to Bhokanal to take part in the FISA Asian and Oceania Olympic Qualification Regatta at Chung-Ju in South Korea earlier this year. Dattu came second with a timing of 7:07:63 seconds to qualify for Rio. Just before the event, his mother met with an accident which resulted in a brain injury. Challenges in life seems to be at every corner of his life, but the challenge that awaits this 24 year old rower at the Olympics, will be something he has never experienced before. The Single sculls event will have 32 rowers plying their trade, with the top contender being Mahie Drysdale of New Zealand and Ondrej Synek of the Czech Republic. These two experienced rowers have virtually dominated the blue riband event of this beautiful sport of rowing for the past decade or so. Drysdale, the giant New Zealander is the defending Olympic Champion and also a 5 time World Champion. He owns the current World Best Time, which he set at the 2009 World Rowing Championships at 6:33.35, nearly two seconds faster than the one he had set three years prior. His arch rival Ondřej Syncek, from the Czech Republic, came second at London but has won the last three world championships. More often than not, Drysdale and Syncek, go comfortably below 7 minutes and thats a worry for the Indian. Breathing down on the necks of these two, is the multi faceted Croatian Damir Martin, the European Champion and winner of World Cup Stage 3 at Poznan earlier in the year. Martin gave a real fright to Drysdale before settling for the silver, but relegated Syncek to fourth. Nestled in between these three is the Brit, Alan Campbell who secured his place at RIO, by winning his country’s Rowing Team trials for the ninth time. Campbell goes below 7 minutes comfortably, when he is injury free, which he was not for most of last year. His performances this year indicate excellent recovery, and he is one of the top 4 contenders in this event. There are some excellent rowers from Australia, Hungary and Poland to add to the depth in the field. Most of these rowers, especially from Europe and Australia/New Zealand have adopted cutting edge technology in their training methods and almost always have an edge over their Asian and African counterparts, in aspects like endurance and conditioning. But for Dattu, who should be under no pressure, this experience should be beneficial. If his performance can open up avenues for future Indian rowers in terms of exposure tours and latest training facilities, he would have done more than what is expected of him.